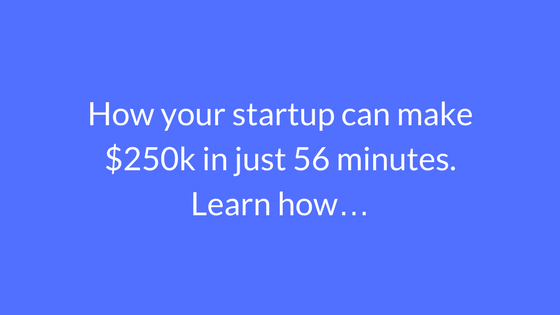 How Your Startup Can Make 250k in Just 56 Minutes? Let me quickly introduce myself. I’m Samit, and I am a Kickstarter consultant and crowdfunding expert. My first project I got involved in was a smartwatch called BLOCKS, the world’s first modular smartwatch. Blocks was a smartwatch you could put together like Lego. Each module of the BLOCKS watch has a specific function – a heart rate monitor, contactless payment card, GPS, and more. You choose which functions you need, and wear what suits you. We launched our BLOCKS Kickstarter campaign on October the 13th, and by the end of the campaign, we raised $1,613,874. We reached our initial goal of $250,000 in just 56 minutes. This is how. You don’t have to have the perfect product to succeed, but it must be exciting. What would you feel if you heard about this product? Does it make you salivate? There are 7 billion people on this planet. If it excites you, it will excite others, no matter how niche it is. BLOCKS has an incredible product that is challenging the likes of Apple and Samsung, so it’s no surprise it got tech fans excited. BLOCKS has been in development for the last two years. Most of that time, we’ve been perfecting the technology. It was vital that we had something to show for our work so that we could get it out into the world. With nothing more than an idea, it’s almost impossible to promote your brand. We entered a number of competitions, not only to win some very attractive prizes but also to find influential people to help make our project viable. We made our mark in the Intel “Make It Wearable” competition, and we won $50,000 in the People’s Choice award category. The Intel competition opened many doors for us. It helped us connect with key journalists, investors, and other tech companies that would later help make BLOCKS what it is today. We also received press that helped build up awareness and lay the foundation for our incredible fan base. Contests can be the perfect platform to get your idea out into the world. If your product is attractive enough, you’re guaranteed to find backers whether or not you win. We tested our product concept after we’d proved it could work and offered an exclusive membership for just $50. This allowed a few people to get exclusive information as well as early bird discounts. They’ll get special privileges when we launch as well as behind the scenes insights. We landed up with 1,000 early members, which validated that people wanted our product, as well as providing some capital and motivation. If you have what you think is a great idea, try and validate it as soon as possible. You need to know that the work you’re doing won’t be wasted. In building up that 1,000-strong fan-base, we had located the people who would play a key part in shaping our product. We worked together towards a product that our typical user would enjoy. We listened closely to their feedback at every stage and even organised weekly Google hangouts with the founders. We created a list of content that our fans and potential customers would be interested in and curated a long list of content. We had some fun articles that we published to websites like Buzzfeed, Tumblr, Reddit and to our blog, with titles like “50 Craziest Inventions You Won’t Believe Exist.” We also had serious articles around recycling and other important social topics. We used these articles early on to build up traffic and awareness of our product by targeting various niches with content. We started building our social media presence from day one. Early followers will more than likely be your first customers if you readily engage with them. This is how we got access to our future fan base. We built up to around 80,000 Facebook fans using a combination of paid ads and competitions, as well as engaging content, as mentioned above. Our social media strategy can be broken down into 3 stages: Imagine, Excite, and Get Backing. Imagine simply meant getting people’s imaginations working as to what they could do with this smartwatch. This lets them really visualise and get hooked on the idea of BLOCKS. For example what if you could use the watch as a controller to fly your drone or as a monitor to check your blood sugar levels. The second stage was to Excite. Once we got their imaginations into overdrive, everyone wanted to know details. Would BLOCKS exceed their expectations? We carefully showed various product shots and released details of the product. Specs are very important on a techy project, especially one that is as revolutionary as BLOCKS. There were lots of sceptics. There always are – those are the people who ensure you think of everything. By having to carefully explain the product in the simplest terms, we identified the potential problems, as well as what the product was still missing. The third and final stage was to Get Backing. This simply meant ensuring that the fan base is ready to buy, a week before we launched. We built up anticipation. We planned every element of our launch, including details of rewards, plans on what it would take to reach our goals, and every last thing that would entail. Another key element was building up our mailing list. We included various CTAs (calls to action) on our website that encouraged people to sign up. For example, we gave fans the chance to win our product, as well as the opportunity to get early bird discounts. We built up our mailing list to over 25,000+ addresses. We regularly engaged those on our list with content about the product and interesting developments. We showcased what was going on behind the scenes. We also created a drip campaign – any new user that signed up to our mailing list would get three emails. The first was a simple welcome from the founders, a very personal message thanking them for joining the community. The second was product-oriented and presented more details about the product’s possibilities – feeding into our theme of Imagine. The third revealed exclusive images of the products and specs. This drip campaign lasted two weeks, after which the recipient would be added to the normal mailing list. Having a mailing list of over 25,000 also brings up its own unique problems. Not everyone responds to the same subject lines or content. The timing of the emails is also important, but we had people in many different time zones. We, therefore, re-split the emails with different subject lines and at a different time to make sure as many people as possible opened at least some of them. We’d been building up connections with various members of the press for the last few years. You can see the guide on how to contact the press here. Some of them we knew very well, as we had connected at the various competitions. We had been privileged with having a few articles around our project since we started, which helped build up excitement early on. We created a list of press and journalists that would be interested in BLOCKS, we went through niches as well as mainstream media. We contacted them one by one, a month in advance, connecting with them and telling them about the details of the launch of the project. We requested non-disclosure until the day of our Kickstarter launch so that at the time of launch we would get a massive influx of traffic. We also had a few pre-announcements shortly before we went live, like the new promo video and announcements of which crowdfunding platform we’d be using. We ended up getting featured by BBC, Mashable, TechCrunch, Core77,Product Hunt,FT and another 200+ throughout our campaign. A few weeks before launch we again utilised our fans and asked them whether they wanted to join our ambassador program. We made it clear from day 1 that this was not about getting anything free. Rather, it was about playing a part in revolutionising the industry. We had over 1,000 applicants, which we shortlisted to 300. We asked people three main questions: where they were from, whether they were active in any tech-based forums, and whether they knew any press/journalists. This group of ambassadors helped us gain important access to press members we had not yet connected with. They also helped create a real excitement around the launch. To make sure everyone saved the date for our launch and purchased on the first day, we created a Facebook event. The whole team invited all their connections, and we also got our fans/ambassadors involved in inviting their own friends and families. We ended up inviting over 30,000 people to the event. The Facebook event was set up so anyone who hadn’t followed our project was still easily able to understand what the project was about. We also set up Thunderclap, which sends out a message on social networks all in one go. This acts as another reminder and helps raise awareness. We again invited friends, family, fans, and ambassadors to join up. we managed to get a social reach of over 1,800,000. It was a combination of these principles and tactics that got us to $250,000.00 in 56 minutes. These were the main methods that we used to help create excitement and get everyone buying immediately. With all this preparation, all we had to do on launch day was sit back and watch the funding pour in. If you have an amazing product, you need to make sure you get the reach you deserve. We managed by using the above tactics. You can too.